Over the last couple of days, Samsung and LG have both announced new smartwatches, and several more are expected next week. Not one to miss out on a hot new trend, HTC is also working on a smartwatch of its own. This isn’t the first time we’ve heard whisperings of HTC’s plan for a smartwatch, though it’s the first we’re hearing about a September release date. Word comes via a tweet from Twitter user @upleaks. A relatively new entrant to the world of phone leaks, @upleaks claims the HTC smartwatch will be based on Android Wear and will enjoy a North American launch in September. The watch will also launch in Europe, the Middle East, and Africa as well as Japan, Brazil, and Korea. HTC has been tipped to release a smartwatch for months. According to reports we heard in May, the device will be called the HTC One Wear and would be round in design. Those rumours said we could expect a late-August launch. In July, a hardware render made its way online thanks to noted (and now retired) leaker @evleaks. 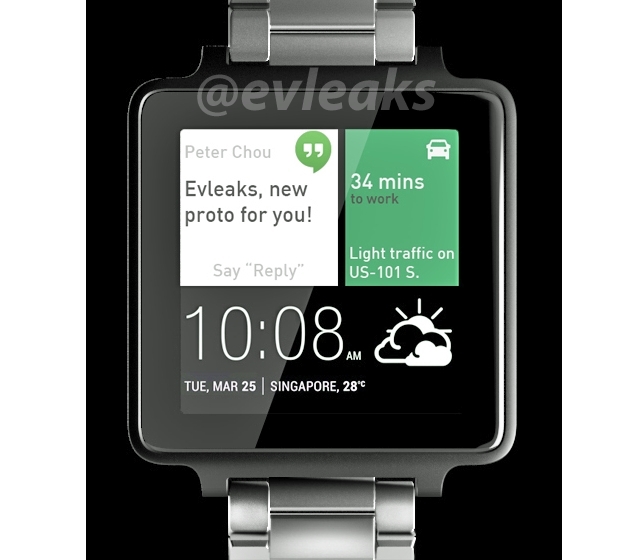 This render showed a square watch face with a metal chain-link band, not unlike the Pebble Steel. Next week is gearing up to be a pretty exciting week for HTC. The company teased its 64-bit Desire 820 earlier this week, promising more information on September 4.